Click. Swipe. Tap. Rush. Work. The daily grind of it makes it hard to find meaning. But you can cut through and make a meaningful act by supporting animals in sanctuary. The Trust’s Deep Peace Farm sanctuary (A Place if Peace) cares for almost 500 formerly at-risk animals and their children. Meaningful Monday is our way of spreading a little meaning in the world. 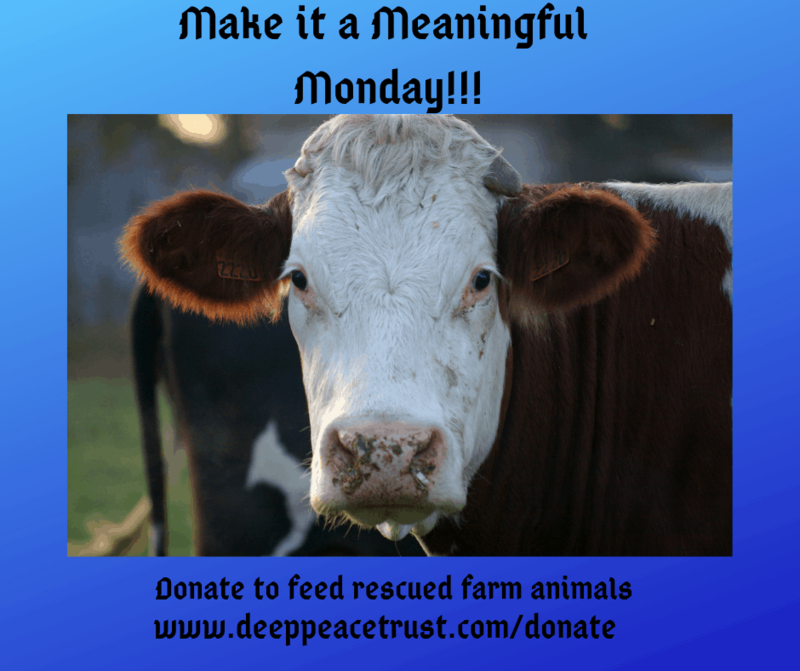 Your donation helps ensure that animals in sanctuary stay happy, healthy, and fed. Can you help spread the love and meaning? Please help us encourage others to make regular donations, as hay for the animals is still incredibly expensive. We’re coming back into the dry times, and the need for hay is gong up again. Your donation helps keep the animals happy, healthy, and well. It’s a way to give back, and to show the world that you think that the lives of animals have value.